I have a PhD from the Interdisciplinary Program in Environment and Resources (IPER) at Stanford University, where I worked with Chris Field at the Carnegie Department of Global Ecology, and was co-advised by Bill Durham. 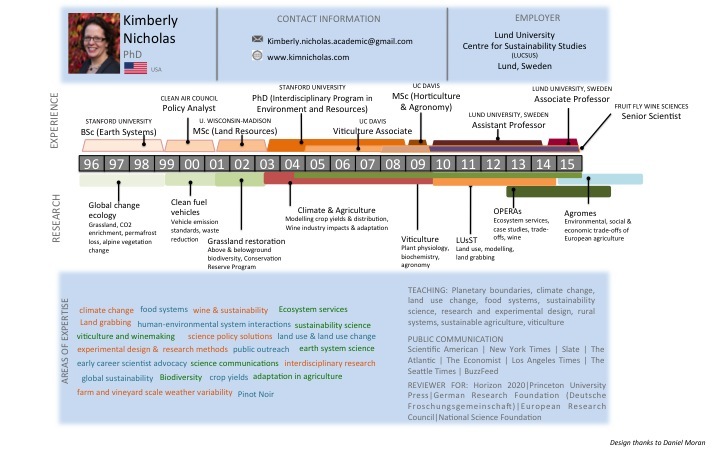 I have two master of science degrees: one from UC Davis in Horticulture and Agronomy, focused on ﻿Viticulture﻿ (winegrowing), and one in Land Resources from the University of Wisconsin- Madison, where I worked with Jon Foley at SAGE and in Chris Kucharik's lab. I have a BS in Earth Systems from Stanford University, where I wrote my senior thesis with ﻿Steve Schneider﻿ in the ﻿Goldman Honors Program﻿.